Sennheiser has become a brand name for headphones. Sennheiser Momentum headphone 2.0 is not only a good sounding headphone but it also has some amazing features. If you compare it with other popular headphones, then this one wins big time for all the features it offers. Sennheiser Momentum 2.0 is the number one headphone for wireless noise cancellation. No one can beat its performance in this department. The sound quality of the headphone is top notch. The headphone is stylish and classy in looks and that is what appeals to the young generation. This is the upgraded version of Sennheiser Momentum, so there are many features that are updated too. The headphone offers an audiophile quality wireless performance and that makes it different and well liked. The battery performance of the headphone is good being wireless and it offers up to 22 hours of standby time. The headphone offers momentum sound experience that transports you to your own world of music. The two seamless microphones give you an amazing experience. The headphone has a balanced audio reproduction. The headphone is big in size and the build quality is also sturdy for your regular use. It’s indeed a great wireless headphone with awesome features. Sennheiser Momentum 2.0 headphone is your perfect travel companion. It features active noise cancellation that completely blocks the sound of the environment. As it completely blocks the environment noises, it allows you to hear your music crystal clear. It is also good if you need it for complete isolation. It also improves the sound quality of your music as it features four microphones. The performance of this particular feature is great. You must buy the headphone for this amazing feature. It also lets you receive or make phone calls with a clear audio quality. If you are an outdoor person, then Sennheiser Momentum 2.0 headphone is perfect for you. It works great with your long gym sessions or any strenuous outdoor activities. And, the best part about the headphone is, it’s quite durable. The weight of the headphone is feather light. You can expect complete comfort even if you wear the headphones for hours at a stretch. Sennheiser Momentum 2.0 headphone is perfect for your long music sessions. You can hear clear audio with the kind of technology this wireless headphone uses. It’s also perfect if you want to play games for hours at a stretch. It’s also ideal for your movie sessions. There are many great features of Sennheiser Momentum 2.0, let us look at some of the key features. Sennheiser Momentum 2.0 headphone has a high resolution and deep vocal tonal audio. A new generation of MOMENTUM headphones carves out every auditory tone in even better detail. 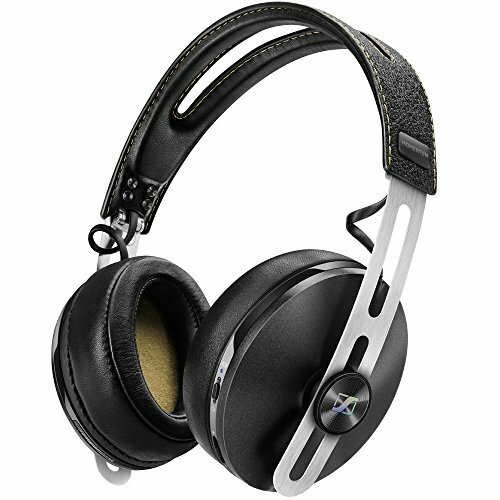 The headphone features proprietary 18-Ω Neodym transducers. With big diaphragms that make the mark MOMENTUM resonance and even better experience. The sound of the headphone is unambiguous and detailed. It also features a powerful bass base. The headphone comes with sliders made of stainless steel. The look is luxurious with leather covering the soft designed ear cushions. Its quality and its finish with precisely placed seams make the MOMENTUM a pleasure for all senses. Its actually timeless and amazing performance will enthrall every music lover. Sennheiser Momentum 2.0 headphone is truly comfortable. The flexible headphone is attached to small ball joints running in collapsible sliders made of simple brushed stainless steel. You can easily adjust the headphone and sound. It gives you a comfortable experience. The headphone has a great connectivity base and wireless feature. With its profile, the angled 3.5-mm stereo jack plug is optimized for the use on all the devices. It supports almost all the apple and android devices. The headphone features noise Guard active noise cancellation that blocks ambient noise using four different microphones for great isolation to considerably improve sound quality in noisy environments. You can also travel along with the headphone. The battery life of the headphone is simply amazing. It gives 22-hours of battery life with Bluetooth and Noise Guard activated to ensure performance is at its optimal level. The charging feature is also good and there is no issue as such. The headphone uses an amazing technology with two built-in microphones working seamlessly to improve voice quality. It also removes outer noise during phone calls so that your audio is clear. Sennheiser Momentum 2.0 headphone features Bluetooth smart ready and that makes the connectivity good. The headphone includes rechargeable battery too. The headphone is easy to carry so you can carry it along wherever you go. It’s perfect for your travel and outdoor activities. Sennheiser Momentum 2.0 headphone features soft cups that are decently designed. There is no pressure on your ears as the cups are light in weight. There is no tension or clamping on your ears as well. You can enjoy your long music sessions without any problem. The only problem with the headphone is its padding support. The headphone does not feature added padding and that can cause some inconvenience at times. It is also stiff and sturdy so it can pose a problem if your head size is too small. It’s ideal in fit for bigger head size or medium sized head. Overall comfort is good. Sennheiser Momentum 2.0 headphone features NoiseGard technology that uses four microphones for its active noise cancellation. This is the highlight of the headphone and makes it quite popular in its league compared to other headphones. The noise cancellation feature is so amazing that you will not hear a single noise from the ambiance. Even while traveling, there is complete cancellation so that your audio is clear and crisp. It also features complete flexibility. You can use the feature according to your need. But, for the price, the feature is truly amazing and good. If you need to use it for traveling, then the feature is quite effective. Sennheiser Momentum 2.0 headphone is not only well crafted but truly stylish too. It’s comfortable and sturdy in design. It’s light in weight so you can use the headphone for hours without any stress. The ear cups are dense and the metal body frame is well built. It can sustain well even if you drop the headphone. There are many control options in the headphone and that enhances the overall look of the headphone. However, you can feel slight stiffness if you wear it for a longer time. The design and build are smooth. You can adjust the headphone according to your comfort, which is great. Sennheiser Momentum 2.0 headphone is a good sounding headphone. The performance is not exceptional but not too bad either. The bass base is good in the mid-range. The treble is not that great. The headphone also suffers in the low range but it depends on the type of music genre. The sound of the headphone is good in the higher range as well. For a closed back ear, the headphone is really good. The wireless feature does not really affect the sounds and that is a great feature if you compare it with other headphones. It does not feature a good soundstage and that is again a drawback. A good wireless headphone with a great battery life is always well liked. Sennheiser Momentum 2.0 headphone also features a great battery life and stands true to what it says. Up to 22 hours of battery backup with active noise canceling feature and the wireless feature is pretty amazing. You can enjoy continuous playback with the headphone without any distortion or trouble. However, it is important that you fully charge the battery before you use it. It does not feature a power saving function and there is no passive playback. The connectivity of the headphone does not really affect the battery. The performance of the battery is good. It has a great audio reproduction. There is no leakage in sound. It features effective noise cancellation. It suffers in control department. The isolation can be poor. There is no added padding. It does not feature soundstage. The headphone is big in size. Sennheiser Momentum 2.0 headphone indeed gives you a great performance in sound and active noise cancellation. Design wise also, it’s great and fit is also good. If you are looking to upgrade your old wireless headphone with this option, then you can consider it. It definitely gives you value for money and in fact, it’s one of the most popular headphones offered by Sennheiser. Being wireless also, Sennheiser Momentum 2.0 headphone offers some great features. Though it does not feature sound stage, still, the audio quality of the headphone is clear. If perfection is what you look for while buying a good headphone, then Sennheiser Momentum 2.0 headphone should be an ideal choice for you. If you compare the headphone with other brands, then the price is not too high. So, you can go ahead and buy this good looking and good sounding piece.